I’m sure you’ll all be happy to know that this week on the blog we are leaving calibration curves and math behind us! Don’t worry, if you still have questions about instrument calibrations, or a new issue arises in your lab, I’m always here to help you address those. In talking to some of you at FELC a few weeks ago, the issue of troubleshooting came up a few times. I know this can be a hard topic and really digging into a broken instrument can be an intimidating idea for some people. But I’m going to let you in on a secret….it’s maybe one of my favorite activities to do! We’ve all had that moment….we started samples on an instrument, left for the night expecting to come back in the morning to a nice, completed data set, and return to find that our instrument malfunctioned! Now results are behind schedule and you have the added issue of an instrument that just refuses to cooperate. Troubleshooting can be a frustrating and tricky activity to complete, especially because instruments never break at convenient times. If I had a dollar for every time an instrument broke when I had rush samples to do, I wouldn’t have to work anymore! But, because instruments will always continue to break, and I need to keep my job, I thought I’d fill you in on some of my favorite troubleshooting tips. A good way to make sure you don’t overlook any parts of your instrument is to start at one end of the instrument and follow the sample path through to the other end. It’s easy to jump from place to place first, maybe checking your sample loop before jumping up to check your eluent filters. Odds are that you’ll over look something, and your issue will be in the place you over look. Following the path helps ensure that you give every section of you instrument it’s due investigation. One of my new favorite troubleshooting tools is a spare autosampler syringe! When I need to troubleshoot one of my instruments with a large amount of tubing, I’ve found that using the syringe to carefully inject DI water into each section of tubing is a quick and easy way to look for the source of the problem. Maybe a section of tubing is plugged, maybe it’s cracked, maybe there’s a dust bunny lodged in the end (true life this has happened to my IC!!) It’s so hard to tell sometimes by just eyeballing the sections, but this technique has yet to fail me! Sometimes the source of an instrument issue isn’t related to the “science-y” components we would typically focus on. Sometimes exhaust fans wear out or autosampler screws fall out or sheer off. Don’t be afraid to look into the more mechanical parts of your instruments. Think of them as support systems. If your autosampler syringe housing is loose and wobbly because a screw is loose, maybe the syringe isn’t being held firm enough to puncture the vials. If you’re lucky, your instrument will be smarter than you. Sometimes the software might notice that something is wrong and stop the analysis run. If it’s not….you’ll come back to a broken syringe plus a lack of data. If you have any fun or interesting troubleshooting tricks that have never steered you wrong let me know! I’m always on the hunt for new ideas, and if I get enough, we might do a part 2 later. Having as many tools in your troubleshooting tool belt as possible is so beneficial, and it’s one of the areas that we should all constantly be striving to improve. You’ve bought some standards and you made a multi-point curve. You might think your work to improve laboratory accuracy is over, but then doubt starts to creep into your mind. What if something’s gone wrong!?! What if you run a sample and you expect one answer and your instrument tells you another?! Is the sample bad, or is there a problem with your calibration curve? Has something gone wrong somewhere in your plant’s process, or do you have a bad batch of calibration standards!? The first step in ensuring that your calibration curve is up to par is checking the Correlation Coefficient. I know, I know….more math….but stick with me here because it’s important! The R2 value of your calibration curve has a large amount of statistical power. No one wants to talk about statistics, but it has a lot to do with how well your instrument is calibrated. In a nutshell, the correlation coefficient gives you an idea of how well the standards relate to each other. R2 values statistically can range from -1.0 to +1.0, but on your instruments, you should look for a value as close to 1.0 as possible! Values of R2=0.9987, R2=0.99943, or R2=0.9963 are examples of what you are looking for. The closer to 1.0 your R2 value is, the stronger the relationship between your standards. A strong relationship between standards leads to more confidence in the reported results for your samples. Remember that your standard value points hug your samples, and no one likes crappy, wet noodle armed hugs! It’s listed somewhere in your instrument’s software, you might just have to look around for it. So you’ve got a strong curve, but calibration curves can be strong….but wrong! How can you check the accuracy of the standards you used to make the curve? There is a way to prove that you standards and instrument are operating correctly. 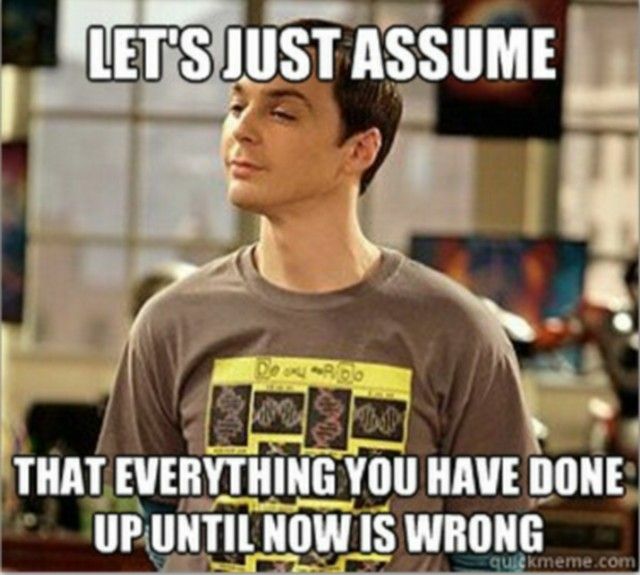 We are going to employ the Dr. Sheldon Cooper of standard….the validation standard! Just like Dr. Copper, the validation standard knows more than you, and it isn’t afraid to tell you when you’re calibration is wrong! The validation standard should be a standard SEPARATE from your curve! Buy it from an alternative supplier, buy a different lot of a standard you use in your curve, or buy 4 standards and just pick one to use only as a validation….just don’t use your validation standard as part of your calibration curve. If you just analyze one of your calibration standards again as a sample, you will get the right answer 100% of the time….because somewhere in the software you’ve entered those values in as the answer. This might look promising, but it tells you ZERO useful information about the accuracy and correctness of your calibration curve. The validation standard’s “job” is essentially to be an unknown sample, that you secretly know the answer to. A good basic rule of thumb is that the difference between the known value of your validation standard and the instrument’s reported result based on your curve should vary no more than 10%. We’ll call this “Validation Recovery” for ease of terminology. For most applications, 10% is much larger than the recovery should be, but if you’re just started down the path of improving your laboratory accuracy….it’s a good basic place to start. From here we are going to have to dive into a bit more math, and I think we can all agree that one math topic per post is frankly too much math! Next week I’ll cover the basic statistics of calculating a more precise validation recovery range for your instrument, tracking validation recovery, and how you can use that information to access the performance of your instrument! Duck season is upon us!! A successful harvest so far this season means that I’ve had a fun chance to do something new with a protein I’ve never used. I’ve had restaurant duck plenty of times, and it’s always been delicious. But wild duck is a whole different animal, and it really puts a whole new spin on it when you can take something all the way from harvest to plate. The most shocking part of duck season so far is how strongly Madam Roo has taken to the whole situation. My usual timid, perpetually nervous girl has taken to charging right through The Engineer when he arrives home that she can go investigate what he’s brought home every morning. Poor guy just wants to say hello to her, and she can’t even be bothered until she’s accessed the daily harvest. I’ve shared this already on Instagram, but it’s just too good and too cute! I have grand cooking plans for all sorts of wild game, so I tend to get a bit bossy with home the birds should be cleaned. Sadly, it’s been a bit too early in the season to pluck a bird for roasting. They have all been about halfway between their summer feathers and having their dense winter, downy feathers grow in. This has just led to a mess of plucking, so sadly I haven’t had a bird yet for roasting with my canned apple chutney. That will come with time I’m sure, but I am antsy to try that and let you know how it goes! While we patiently wait for the birds to fully plume for winter, and hopefully cleaner plucking, we’ve been breasting out the birds. I tend to be a bit more skilled than The Engineer in that capacity, so bird cleaning as really become a whole family affair. We usually try and keep Scout in the house while the knives are flying, but she’s taken to crying like she’s being beaten if we are out with the ducks without her, so we usually cave about halfway through. Ummm excuse me iz trying to investigate pleez! Pleez do not mind while I investigate these ducks pleez…. My very first adventure into cooking duck was Spicy Thai Duck Burgers curtesy of From Field to Plate. I’ve used other From Field to Plate recipes before, and I’ve always had really great results. I really can’t say enough good things about his lime and tequila turkey marinade! The burgers were alright, but I would defiantly tweak the spices and flavors next time we make them. I think I’m just not a huge fan of cinnamon paired with meats. I know that it’s a normal flavor profile in some Eastern cuisines, but it’s just not my favorite flavor. Also, I didn’t find it all that spicy, and even The Engineer thought it was too mild. I will say I did half the jalapeño in the slaw, but usually a single jalapeño is all The Engineer can tolerate spice wise. It’s so hard to know especially because every pepper is a little different, but it could have used way more oomph. I would definitely remove the cinnamon and amp up the spice for round two. Also, I don’t like peanut sauce and it was a Wednesday night, and I was feeling lazy…..so I cheated and bought some peanut sauce for The Engineer. The From Field to Plate homemade version is probably much better. If you’re into peanut sauce and give it a try let me know! High on list of things you don’t want in your burger patty….. This week we were a bit crunched for time, so instead of trying a new recipe we went to an old fall back. Friday night duck taco and nacho night with margaritas was exactly what this week called for! Just treat it exactly the way you’d use regular ground beef, and no one will even know you’re sneaking waterfowl into the dinner rotation! I do a bit feel like I’m not really using the ducks to their full flavor potential, and it’s making me a little bummed. I’m not really in love with the texture of ground duck….it’s a bit soft. More on the side of ground turkey or chicken then say ground beef or deer. It defiantly goes better, in my opinion, with something crunchy….slaw or tortilla chips. But, at the end of the day, it’s all getting gobbled up and that’s really what counts. Meals do really mean more when you know the time and sacrifice that have been put in to make them happen. So many people have moved so far away from knowing where their food comes from. Nothing that arrives on your table arrives by magic, and I’m glad that in this house we are active participants in at least some of the meals that arrive on the dining room table. Bonus points for not having any shot end up in the taco meat! I’ll take that as my major victory for the week!! Welcome back for the second week of Common Calibration Conundrums and Other Laboratory Queries! Before we get back into the science fun, I have an exciting announcement. Bion Sciences now has an Instagram account! Come follow along with us! There will be blog notifications, access to our website, and photos of the Bion Sciences team in our natural, laboratory habitat! Now that we’ve covered how often you should calibrate an instrument, we should talk about how you pick standards to use for your curve and how many standards you should be using. Think back to algebra when we first learned the equation for a line. If your math teacher was anything like my math teacher, they drilled into your brain that 3 points are needed to accurately verify a line and the corresponding slope. One point is simply a dot in space, and two points allow for too much swing in the correlation of the line, but three points……three points is really where the magic starts to happen! Don’t get overwhelmed with the math, I’ll simplify this for you! The accuracy of your line, and therefore your results, improves dramatically as more data points are added to the line. Think back to our puppy from last week. If you only tell the puppy once a day, every day to potty outside, your results might be somewhat….questionable. Now imagine you tell that puppy 3 times a day, every day, to potty outside. The chances that puppy is going to catch on greatly improve! The same goes for your instruments. When it comes to calibration points, more is always better. Again, there is no such thing as over calibrating an instrument! The more data points you provide the instrument, the accuracy of the answers the instrument provides you will also improve. The only issue that arises from more calibration standards is the time it takes to analyze each standard. It’s important to find a balance between the most accurate curve you can produce and managing the time restrictions inside your lab. Let me give you an example. Suppose you run 10 calibration standards….but because it takes several hours to build that impressive calibration curve you only calibrate your instrument every other month. By the end of the second month, how true do you think those 10 data points are….I would argue they probably aren’t accurate anymore. 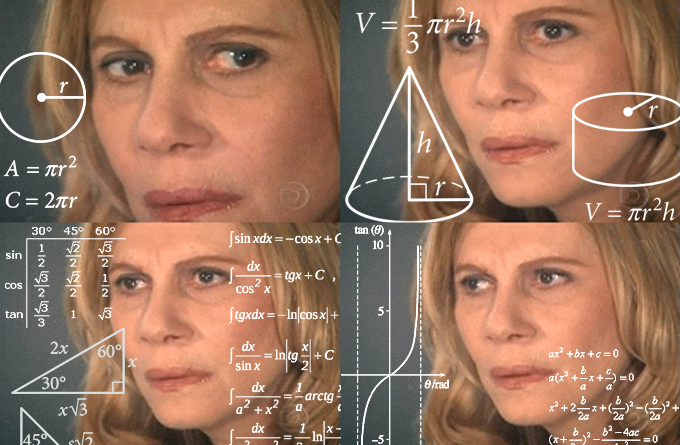 Instead, what if you ran 5 points once a week, or 3 points every day?? A smaller, more current curve will almost certainly produce more accurate data. In the world of the laboratory, accuracy is the name of the game! A good rule of thumb is that your calibration standards should “hug” your expected value. For example, if your anticipated answer is 3ppm, you wouldn’t want to make a curve using points 0.5ppm, 1.0 ppm, and 1.5 ppm. You also wouldn’t want to use standards that all have values above your expected answer….meaning that 5.0ppm, 8.5ppm, and 12.25ppm also wouldn’t make a good curve for a value of 3ppm. For an expected answer is 3ppm, I might select standards with values of 1.0 ppm, 2.5ppm, and 5.0ppm. Typically, the wider the range of expected answers, the larger the range of standards should be. Remember, your values need to be hugged by calibration points, not left to fend for themselves on the outskirts of your curve. Every once in a while you might have a stray value that exceeds the boundaries of your calibration points, and that’s fine….every once in a while! On the day-to-day and with your typical samples though, your results will be most correct if they are contained within the confines of your calibration data points! Next week will be, Part 3: How to Know if Your Calibration Curve is Correct. It’s Big Bang Theory-themed so be sure to keep your eyes peeled for that! In the meantime, if you have any questions about this week’s post or any ideas for future posts but sure to leave a comment and let me know! The flip flops have been exchanged for Ugg boots, and cold weather is here to stay for the next several months. As much as I’ve complained about the looming cold weather’s effects on my Summer garden, the dip in temperatures has given me an opportunity to practice one of my favorite Fall activities…..
Squirreling everything possible away like a crazy and deranged food hoarder! I have no idea why, but I love getting everything squared away for winter. I guess it’s just nice to make the best use of everything. Somewhere between Labor Day and Halloween I start to act like an old time-y prairie grandma, and I feel an overwhelming responsibility to “put everything up” for the winter…..and I don’t feel bad about that at all! One of my least favorite tasks of pre-winter hoarding is sorting out all the herbs. It’s easy, and so important because I do cook with them all winter long, but it does lead to cold, damp, and slightly sore fingers. My preferred way of preserving my herbs is to freeze them. It works quite well, and is faster than drying I think. Plus, I have a secret tip that really saves a ton of prep work time when you need to use the herbs. First, you’ll need to gather up all your herbs. I had thyme, oregano, and cilantro that needed to be dealt with this year. The cilantro was the easiest. Just cut off near the soil, wash well, and freeze on a cookie sheet. Once the cilantro is frozen, transfer to a freezer bag and try and remove as much air as possible. Pull out as needed for Mexican nights or game day guacamole. I find the beauty of freezing them is that they tend to behave very similar to fresh once you add them into recipes. The thyme and oregano takes a bit more work, but it isn’t hard. If you have a delicate, wispy thyme plant you might be able to get away with freezing everything whole. I am apparently some sort of thyme miracle worker and managed to grow a small herb tree. No one wants twigs in their tomato sauce, so I have to pluck all the leaves off the stalks. I like to place a freezer bag into a quart sized, wide mouth canning jar, and then just strip the leaves off directly into the bag. Pinch the base of each twig and gently pull towards the thinner end. For large, multi branched stems you will need to probably pluck each stem singularly. With a little practice and patience you should end up with a bunch of tiny thyme leaves in the bag and a garbage can full of naked….or nearly naked mini trees. Close the bag, leaving some air in, and toss in the freezer. Once the leaves have frozen, crumple them slightly to break them up and remove the air from the bag. Follow the same process for the oregano as you do for the thyme. Here comes the time saving secret! Once the leaves have frozen…..give them a really good crumpling and crunching. Ta da…..instant chopped oregano leaves! Thyme is so small it doesn’t matter, but basil and oregano leaves can get quite large and in charge. The post freeze crumple is much faster than chopping everything before freezing! If you’re looking for a tasty and filling way to use up some of your frozen herbs, might I suggest Chicken Pot Pie Soup! I made it this week and it was a massive success….AND I DON’T EVEN LKE POT PIES! Soup is one of The Engineer’s favorites, and even though he would eat soup when it’s 100 degrees outside, I refuse to make it. This chicken pot pie soup will certainly become a standard in our winter rotation, and it’s easy enough to whip up quickly on a school night! In a large stock pot, melt the butter over medium heat. Once melted, add the garlic and onion, cooking until fragrant and translucent. Slowly add in the flour, whisking vigorously to form a smooth rue. Cook the flour for a few minutes being careful to stir so the mixture doesn’t burn. We need to cook out the raw flour taste, so just keep an eye on it and let it go a bit golden brown. Whisk the chicken stock into the rue being sure to get out any lumps. Add the potato, carrots, and spices and cook until the veggies are tender. Once you potato and carrot are tender, add the peas, ham, chicken, and half and half. Drop the temperature to simmer, and just let everything warm through. Serve up hearty bowls of this you’re sure to keep the chilly temps at bay. For regular nights I would serve it up with a nice loaf of crusty bread for dipping. Or, if you’re feeling extra fancy….or like me, you have some spare pie crust sitting in the freezer…..you can make some crust crisps to give it a more traditional “pot pie” feeling. I just rolled my dough into a large rectangle, cut thin strips, and twisted into fun little pie sticks. I topped with a bit of sea salt and baked at 375 for 20 minutes. Some of them did come untwisted in the oven, but they were still flakey and delish!